Don't sit under this apple tree -- or do anything else there, either! 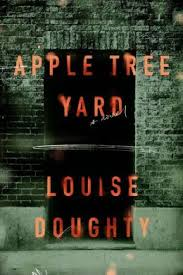 I'm always interested to read books set in London, and Apple Tree Yard by Louise Doughty sounded intriguing. The story begins with Yvonne Carmichael and her unnamed lover on trial for some offense which sounds pretty serious. The opening scene takes place when Yvonne is on the stand being questioned and realizes that the court case is taking a turn for the worse. The story then moves back so that we learn more about Yvonne. She is in her early 50s and one of the most respected genetic scientists in the world. She is in demand as a speaker and consultant and enjoys her status. Her husband, Guy, is also an academic, but they are more acquaintances than husband and wife. They have no real romantic relationship any more, but this doesn't really seem to bother either of them. Their two children are grown and out of the house, although son Adam struggles with mental illness and isn't often in contact with his parents. Everything is going alone fine until one day Yvonne begins an affair with an unnamed man. He initiates contact with her when she is making a presentation in front of a government committee. His air of mystery, combined with his seemingly powerful job, leads Yvonne to behave in ways that she would never have imagined. He remains enigmatic, giving her a secret phone, meeting her for public trysts and generally controlling the relationship, all while giving away little about himself. Yvonne, who up until this point in her life has been the dutiful wife, mother and academic, is suddenly captivated by this secret affair. One evening, after a public rendezvous with her lover, Yvonne is attacked by a colleague after a party. She's completely traumatized, but she can't go to the police or report the incident to anyone for fear that her secret affair will be exposed. Luckily, she does have her powerful and mysterious lover that she can turn to for help and advice . . . The book is written in a really unusual format, with most of it being directed at the unknown lover. Yvonne is narrating the book with frequent references to "you" and what "you" must have thought when such and such happened. It was really rather annoying, but I give the author credit for trying something different! I enjoyed following the story and trying to figure out what would happen next. It takes quite a while for the events to come back around to the trial. I was a bit annoyed that Yvonne, who was seemingly so intelligent, didn't question things a bit more. Still, it was interesting to read about what happened in Apple Tree Yard and how it impacted several lives.